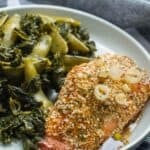 Sesame seed glazed salmon with steamed vegetable recipe – a sweet seafood cuisine with accompanied by an assortment of steamed kale and sugarsnaps. 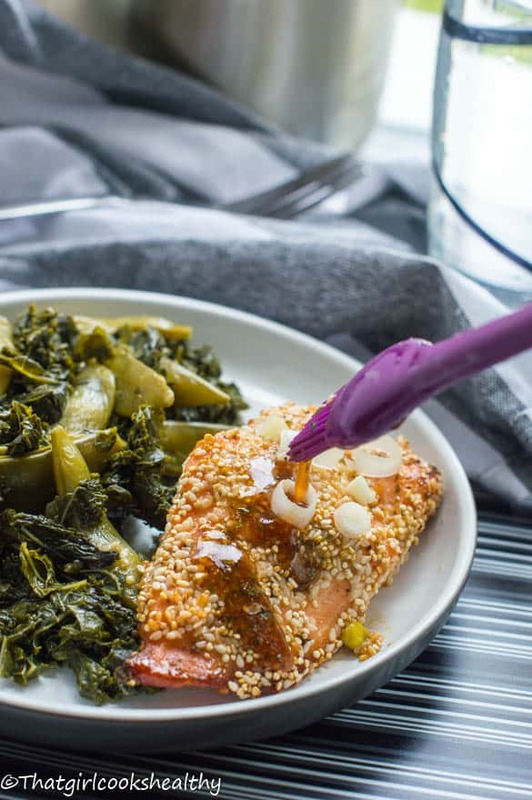 A great way to get in those omega fats too from the sesame seeds and succulent salmon. Rather than pan fry the salmon I simply lightly seasoned, applied the glaze made from coconut nectar and encrusted the salmon with seasame seeds which toasted quite nicely in the oven. No fuss, a very simple meal that takes a few minutes to pull together. Salmon can be quite costly, so while fresh salmon might be within your sights, feel free to opt for frozen salmon (ensure to thoroughly defrost). The results will be identical whether fresh or frozen is used. The glaze is where the favour really derives, it’s a combination of coconut nectar, coconut aminos (a paleo substitute to soy) you can buy this from your local health store or amazon should carry it, cayenne pepper, garlic pepper, parsley and himalayan pink salt. Keep in mind the glaze for the recipe makes a very small batch, double it or triple it depending on your need for extra glaze. 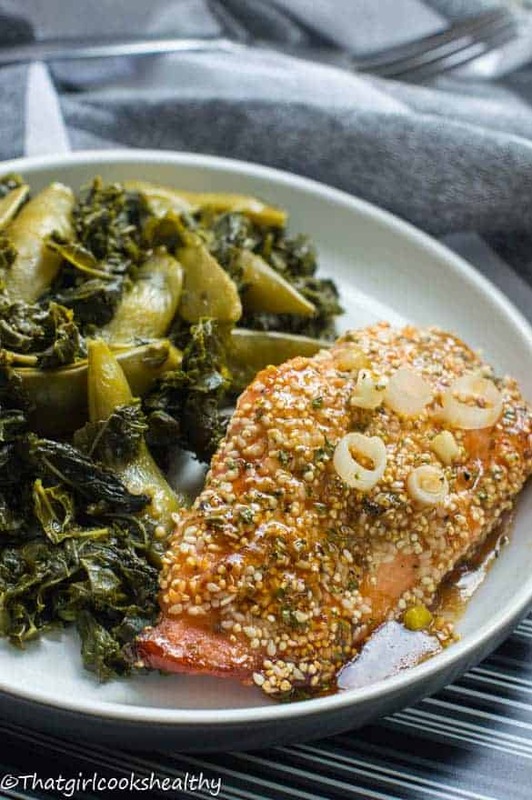 What to pair your sesame seed salmon with? I accompanied the salmon with some healthy greens – kale and sugar snaps – a vitamin K (blood clotting formation) overload. Preheat the oven to gas mark 5 or 190 degrees. Add the chopped kale and sugarsnaps to a medium sized sauce pan filled with 1-2 cups of water. Bring the pan to the boil, reduce heat and steam the veggies until tender this should be to your desired texture. The longer they steam the more darker the hue and softer they become. Once steamed, drain off the excess water. In small bowl combine the coconut nectar, cayenne pepper, garlic pepper, parsley, pink salt and coconut aminos and mix with a basting brush. 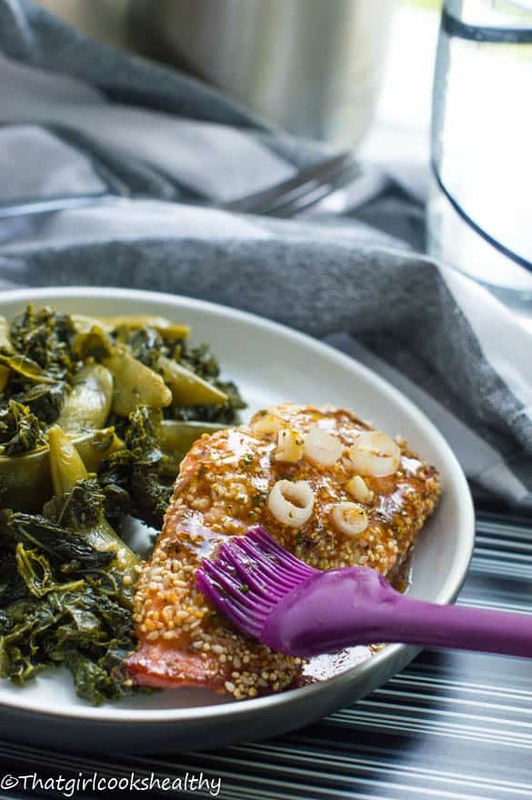 coat the salmon fillets with the sweet glaze and roll both side in the sesame seeds. bake for 20 minutes, ensuring to turn over halfway through so both sides are golden. Wow! You’ve got me drooling here Charlene! The pictures are STUNNING! Thanks Imma, your comment means so much to me. 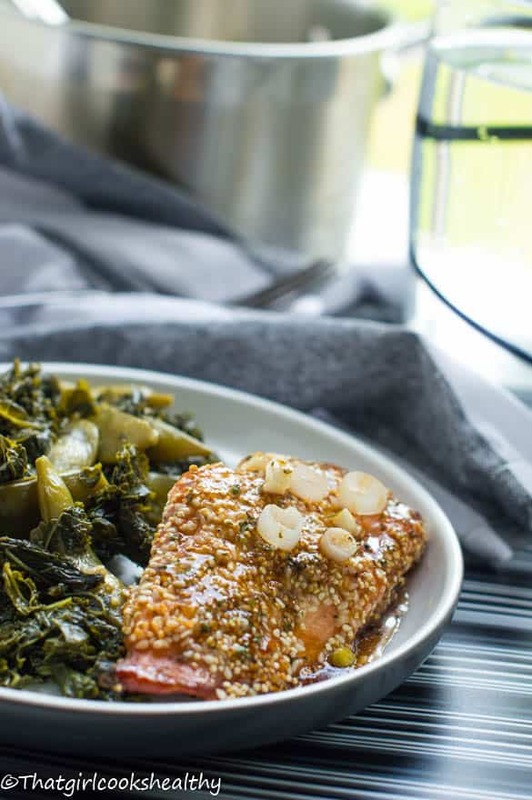 We are avid salmon fans in this house so I’ll be adding this recipe to the rotation for sure. Thanks for linking up to #SaucySaturdays. You’re most than welcome Christine. i just greased down a massive family dinner and find my stomach rumbling again after reading this recipe. This is on the menu tomorrow night! Thx and happy 4th! LOL …Why thank you David. Thanks for sharing it at the #SaucySaturdays Linky party where I found it! Hi Kimberly, thank you for the compliment. Coconut nectar is a low GI index sweetener made from the sap of the coconut tree. If you don’t have access to it please feel free to use another slow releasing sugar such as maple syrup or agave nectar. Coconut aminos is an alternative soy sauce made from the coconut sap and infused with sea salt. I don’t use soy products, but you can use soy or tamari (fermented soy) instead. Amazon tend to stock aminos and coconut nectar if you’re interested. I have never been a big salmon fan until now! I love the sesame seeds because they add a great texture! I like that you used coconut nectar and gingersnaps! Genius! Thanks for linking up to #SaucySaturdays! I hope you will join us next week too! Yay! Another recruit, glad to hear I’ve won you over.